Who doesn’t love pigs and piglets? Pigs are known to be smart, social, they like to play, and they have good long-term memories. 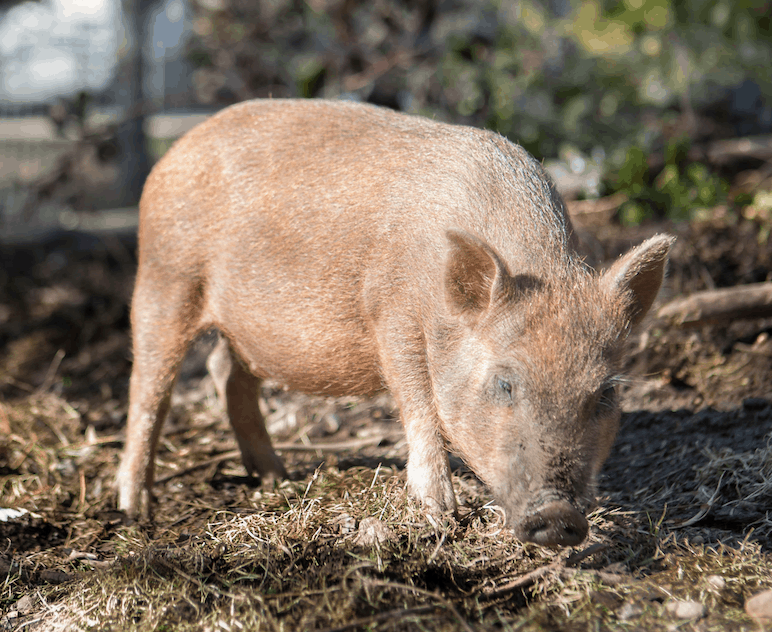 Our animal sanctuary’s first rescued pigs came to Heartwood Haven in January 2018. Josephina is a young Hereford Pig; she was found as a stray in King County. Thankfully she ended up at the sanctuary. Josie will grow up to be a 500 lbs or bigger. We are glad that she is able to spread joy to anyone who meets her. She is loving and trusting and absolutely loves people. But she wasn’t always that way! It took us napping with her and lots of cuddles to gain her trust. Her cute personality will absolutely win you over. Red was rescued from the streets of Puerto Rico as a stray. After the hurricanes, hundreds of pigs were displaced. We took three pigs and Red was the smallest and most skittish. She’s quite scared of humans, so we know that it will take her a really long time to be socialized. Kany also came from Puerto Rico. He was very nervous with us at first, but warmed up very fast. He now loves getting pets and all kinds of attention. How do we know this? Pigs, when happy get a raised mohawk and wag their tails. And maybe it’s that he trusts us enough to roll over for belly rubs. 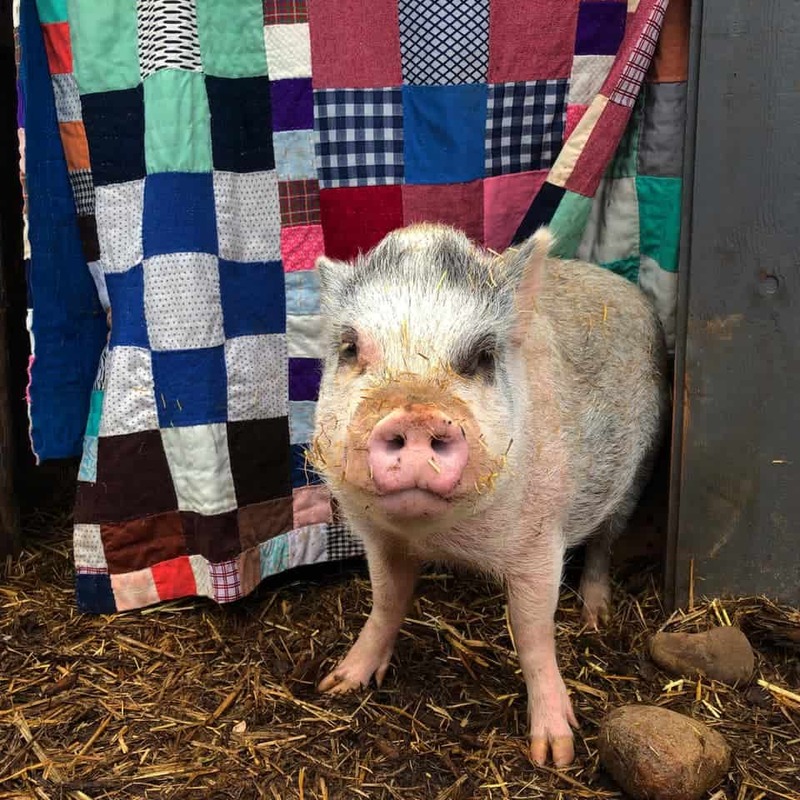 Sanson was the first pig to arrive at Heartwood Haven from Puerto Rico Sanson was found stray in a parking lot. He was skin and bones and his skin was in terrible condition. Sanson has gained a good amount of weight, his skin cleared up and his hair grew back in. Sanson has a terrible limp, and we are working on finding a solution. Wanda is the most precious baby girl piglet who has ever walked this earth. She loves food and taking naps on her brothers Yoshi and Koopa. She loves apples, sweet potatoes, bananas, rice and beans, carrots and cabbage. As Wanda grows and matures, her bossy personality is showing through. While she is the smallest pig in her herd, her personality is bigger than life. Yoshi runs the show around here. Notice that he is quite a bit older than Wanda and that is because they are from different litters. We are not sure why they are completely different colors. The piglets came to Heartwood Haven after being rescued from a neglectful situation where the parents were never spayed or neutered and kept having litter after litter. Yoshi and his brother have both been neutered now. Yoshi now trusts humans for affection and has even flopped over for some belly scratches, something that we once would never be able to do. Koopa and his brother look so much alike; how do we tell the difference? Koopa has a little pink heart on his nose and his right foot is pink. The boys came to us very scared of humans, but that is slowly changing. All the three pigs now wag their tails when we are around, because they are learning to trust us, and food is definitely the way to their hearts. After 9 months at the sanctuary, Koopa now trusts us to pet him! Phew, what a long journey to socialize a once semi feral pig. You can see the intelligence and kindness in her eyes. Ethel is our friend and she has many likes and dislikes just as any sentient being would. Dislikes: Brussel Sprouts. Likes: Tomatoes, Cantaloupes, Mangos, and teaming up with Lucy to flip their water trough in order to make a bigger mud hole. Lucy has developed a special bond with us because she knows we bring the best snacks. When Lucy first arrived we could see all the vertebrae along her spine. In order to help her gain weight we’ve been feeding her separately from her companion, Ethel. Now, learning how to separate these two big girls at meal time has been a mental challenge for the humans. Pigs are smart and they learn your tricks quick but Lucy is in on our game now and she has learned to play along with us. Lucy’s body is finally healing and she now knows the comfort of food and a safe family.